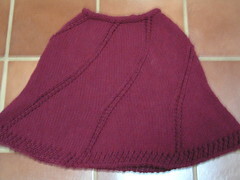 I finished the poncho on Friday. Please excuse the unfocused picture, but it was the only one in the bunch that showed the true color. This pattern is great on many levels. First, it is quick and easy. Never underestimate the joy of quick and easy! Secondly, check out the bell shaping. It really is more of a capelet than a poncho and with that shaping, it hugs the torso until it begins to flare just above the elbows. 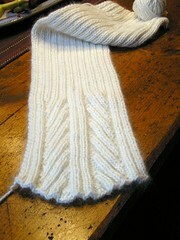 Once that came off the needles, I cast on for this Flared Rib Scarf using Classic Elite Lush. They weren’t kidding around when they named it Lush. this yarn is fantastic – eminently pettable -the luxury of an angora blend! and another quick and mostly easy project! In non knitting news …… D#1 arrived home for her fall break and we have been enjoying a long weekend with her. She heads back tomorrow. It is hard to believe that she is in her junior year. Things have taken a more serious turn and she is beginning to look at grad schools and internships. There will be just enough time to get fresh sheets on the beds and the house cleaned up and …..
Vicki and Cara will arrive on Thursday for the beginning phase of Rhinebeck-polooza 2007! Lovely scarf. How many skeins of Lush? I really like that scarf. And Rhinebeckpalooza – priceless! The poncho is beautiful, I love the color. I really like the scarf, I think I’ll have to make one. I love that scarf. What amazing knitting skills you have! Beautiful knits. Both the poncho and the scarf look very tempting indeed. Have fun in Rhinebeck.